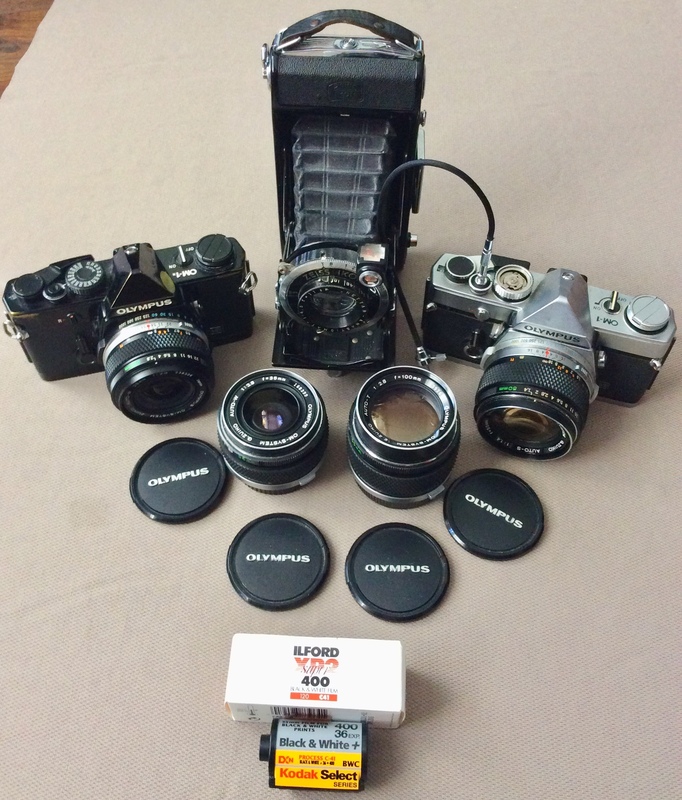 When I wrote the previous post I was just beginning to think about what film cameras to take on my forthcoming trip to Romania. I was then thinking of an SLR, the OM2n, which I know works well. I remember some problem with either the OM1 or OM1n, or both, thinking maybe one had a ‘stuck’ wind-on. However, part of my attempt to get back into film and posting on this blog began by searching for film bloggers, particularly those keen on black and white, to follow, to replace those who had ‘disappeared’. No surprise to uncover a few extolling the merits of the OM1/OM1n which prompted me to dig mine out and find what exactly were the faults. The OM1n had been recently serviced and the meter circuit changed to take a SR44 battery when I was taken out of action, so no attempt was made to follow up till too late – the service guy has ‘disappeared’ too. What I found was that it was the metering which had given up, otherwise it seems to be working fine. This reminded me that the OM1 meter never has worked since I got it and again, although it is a bit battered, that seems to be the only problem. I don’t like zoom lenses (particularly those which change f/ as you zoom – usually the only ones I can afford) so the small but excellent Zuiko primes are a better proposition than the bigger, heavier Zeisses for the Contax, which is in itself is far bigger. So subject to a ‘road test’ I’ve decided to take the Olympuses with four Zuikos – 28mm f/2.8, 35mm f/2.8, 50mm f/1.4 and 100mm f/2.8. For the ‘roadtest’ I’ll load 400ASA C41 monochrome so I can have them processed quickly locally. I found a roll of Kodak Select, which will do for one. I’ll have to get some Ilford XP2 35mm for the other as I don’t have any or maybe I’ll use colour for the test as it doesn’t matter and I have plenty of that. Zeiss Ikon Ikonta for 6×9? However, I found I had 9 rolls of XP2 120 so, the Mamiya Press/Universal being much too heavy and inconvenient, I’ve picked a Zeiss Ikon Ikonta folder to use these. I prefer my older Super Ikonta 530/2 with Tessar lens and range finder but being practical, speeds on the Nettar 515/2 , to 1/250sec, and the 110mm f/4.5 Nettar Anastigmat might be more practical. Still debating. Still debating about the ‘pocketable’ one too. The Olympus XA4 with its 24mm lens is tempting, but it’s heavy for light summer shorts pocket for the 30-40degC to be expected in Romania. As for metering, in general I’m happy to work with ‘sunny 16’ but I’ll have the trusty Weston Euro-Master for more problematic lighting. ← Where have all the film photo bloggers gone? A solution to ‘scanning’ film using a digital camera? The Zuiko 50mm f1.4 is a fantastic lens as is the 28mm f2.8. I also own a 135mm f3.5. My personal choice would be the Olympus simply because it is light,easy, and quick to use. Thanks for the comment Stephan, and the previous one to which I have replied. I don’t have the 135mm but I do have the 300mm (which interestingly shuts down to f/32, only otherwise seen on my old folders). It’s a s bit of a brute. I rarely use a long telephoto so definitely will not be taking that. Good to have your ‘approval’ on my choice.